VOTE! VOTE! VOTE! Tuesday, February 15. See articles 12 & 13. February is Black History Month. See the second item for February 15 and Article #9..
Wed., Feb. 9, 7-10 p.m. – Candidate’s Forum with Dane County Executive candidates – Madison Concourse Hotel, downtown. Free parking in the Concourse ramp. Hosted by Democratic Party of Dance County. This event is open to the public. Tues., Feb. 15, 7 pm – DMNA Council Meeting – Prairie UU Society Bldg., corner of Whenona & Crawford. Any resident may attend, but only Council members may vote. Notify President Jeff Glazer of your interest in attending. Mon., Feb. 21, 6:30-8:30 PM - Health Care Career Series: Physician Assistant Training – new Town Center Forum, Wisconsin Institutes for Discovery, 330 N. Orchard St.
Tues., March 1, Fitchburg Candidate Forum – Fire Station #2 in Fitchburg, 5415 King James Way. Meet the candidates who are running to represent the Fitchburg part of our neighborhood. Additional details will come in a future e-News. 10 - AARP Offers Scholarships to Women. Apply by March 31. Winter is waning. With the longer days, bulldozers will come alive on the site of the future wet pond just below Crescent Road at Apache Drive. This is in the Fitchburg conservation area that was cleared of trees and brush last summer. Officially, this is lots 19 and 20. According to Fitchburg Environmental Engineer Rick Eilertson, on Friday Fitchburg just opened the bids that 13 firms submitted for the construction project. The Fitchburg City Council will be accepting one of the bids very soon. The big noise should start at the end of this month or perhaps in March. In order to get bids, the plans were fleshed out this fall. Neighbors toured the site October 13 with Rick to get details. What will these plans mean on the ground? First, about a dozen trees still left on the site will be cut. (Some trees will remain including a clump of large cottonwoods.) Next, some existing sanitary and storm sewer lines wlll be moved. Finally, the pond will be dug in and embankments raised. It will look like a big project even though the pond is relatively small. Check out the attachment on tree plans to see what will be cut. The trees to be cut are marked with a yellow X on the map. Plans call for two ponding areas within the pond although this won’t be noticeable once the water goes in. The first ponding area, a forebay on the east end, will allow for initial sediment settling. The bigger area will allow for more settling. The entire purpose of the pond is to create still water so that the tiny soil particles and other solids washed off paved and other hard surfaces and lawns can sink to the bottom. Eventually, the clearer water will exit to the wetland below Crescent just where it does now. Besides protecting downstream waters from sediment, the facility will be a place for environmental learning. Signage will explain the purpose of the pond. A group of citizens including some Dunn’s Marsh residents is also working on ideas for what the signage will look like. The group may be recommending additional informational signs such as facts on plants and animals. Eilertson is still accepting volunteers to join this group which will be recommending names for different Fitchburg ponds as well as signage. Interested parties should contact him at 270-4264 direct, 235-0412 cell. or rick.eilertson@city.fitchburg.wi.us to volunteer. For now, this pond is called the Apache Pond. 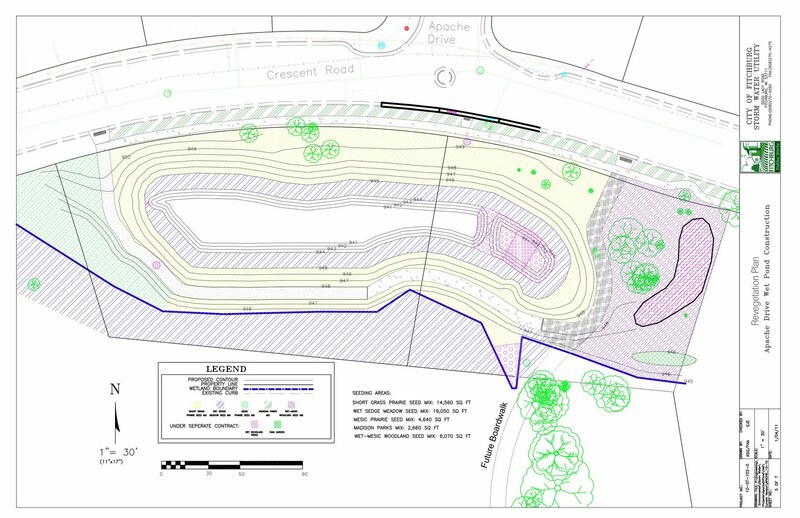 The path around the pond will consist of three surfaces in different areas: mostly limestone screenings like you see on gravel bike paths, some concrete on the south edge which will also serve as an emergency overflow spillway, and blacktop on the east end. Fitchburg may also be applying for grant money to build a boardwalk to connect Crescent Road and the planned Cannonball Trail. The Cannonball will be located along the north shore of Dunn’s Marsh. The blacktop path on the east end of the pond would connect to this boardwalk. This is shown on the planting plan referenced in the next article. By the way, thanks to Apache residents Bill and Becky Martin for asking, “What’s happening with the pond?” Their question spurred me to making a visit to Rick Eilertson at City Hall and ultimately getting the maps you can access with this newsletter. 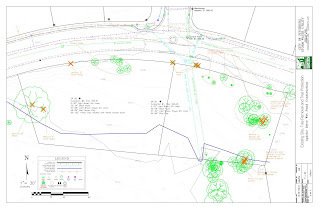 Rick Eilertson also provided electronic copies of plans that show the elevations of the pond and the location of the new sanitary and stormwater sewers. Contact me if you want to receive them by e-mail. 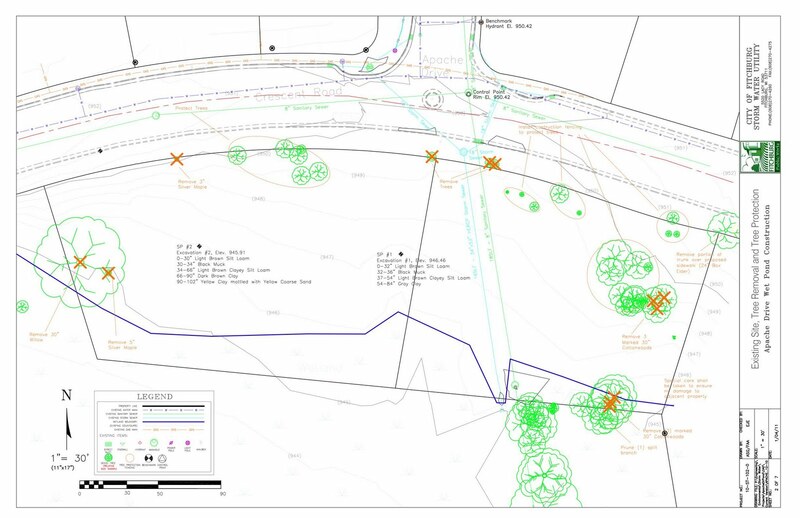 Immediately after construction, probably in June, the disturbed area around the new Apache detention pond will be seeded to a variety of native plants except for the terrace between Crescent Road and the new sidewalk that will be installed along the marsh side of the street. Five different plant zones are planned. Turf grass will go in next to the street. On the map, turf grass is shown with green lines in triplicate. Shortgrass prairie species of grass will go into the upland areas on the south side of the sidewalk and all around the pond. These are varieties such as little bluestem, sideoats grama grass, Canadian wild rye, and prairie dropseed. They will be sowed in the yellow area of the planting map. In the lower elevation areas immediately adjacent to the pond and also on the outside of the berm, varieties adapted to wet sedge meadow will be seeded. The seed mix will contain bluejoint grass, river bank wild rye, reed mana grass, and prairie cord grass. This area on the map has paired blue lines. A mesic prairie seed mix will be cast on the west end of the land. The area is shown with green dotted lines. This mesic prairie will include taller grass varieties such as big bluestem, switch grass, Indian grass, and Virginia wild rye. Closer to the Prairie View Condos the land will be seeded to a wet woodland seed mix. This area is shown with dotted magenta lines. Some seed varieties will be fringed brome, silky and Virgina wild rye, Bottlebrush and bluejoint grasses. Fitchburg Environmental Engineer Rick Eilerson said that the grasses would be sowed, and then when broadleaf weeds come up, they will be killed with an herbicide before a wild flower and forb mix will go in. The wildflower mix will probably be planted in August. Some wet sedge meadow emergent plants may also be put in the shallow part of the pond. Some of the wild flowers planned for the site are bulrushes, blue flag iris, and common arrowhead in the “ermergent zone” of the shallow water. The pond will have a “bench” of shallow water with a 10:1 slope. This is a safety feature to protect anyone trying to wade into the pond. Wading or swimming here is definitely undesirable, if not forbidden, however. The pond will be filling with dirty storm water – not “fishable, swimable” water. Some wet woodland trees will also be planted on the east side of the easternmost lot: swamp white oak and river birch. They are shown in a kidney bean shaped area with magenta hatching between the existing large trees and Dunn’s View condo property line. A small rain garden at the far southeast corner of the easternmost lot will get some showy wildflowers including wild columbine, purple coneflower, New England aster, mountain mint, yellow coneflower, and golden Alexander. Some of these species can be found in the rain garden planted in Marlborough Park a few years ago. 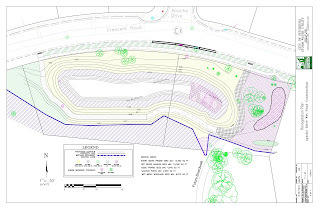 The rain garden is depicted in green hatched lines. I had just glanced out into my back yard, and something was different, wrong. A huge dark heap of something formed a mound partially behind a snow bank under my bird feeder. I peered at it, suddenly realizing that I was looking at feathers, lots of them. My heart fell. First thing that popped into my mind was that a large owl or hawk was lying dead underneath my bird feeder. Had it banged into a window because of the reflected sky there? Had it broken its neck? I hadn’t heard that sickening thump that signals a dead or stunned bird. Still, I felt terrible. I ran for my camera and quickly snapped a photo through the window. As I looked again, the heap moved. At least it was still alive. I grabbed my boots, and after hastily stuffing my feet into them, opened the back door as quietly as I could, hoping to get another picture through the clear air. That’s when the TWO hawks in the heap startled and flew!!! Both winged their way to my tall walnut tree. A pack of crows immediately broke into raucous scolding. Fast as I could, I focused on the hawks and moved the lever on my camera to telephoto. I got my first shot off just as one flew. The other sat and posed for a lengthy time, looking a little ruffled. I think they were first season red-tailed hawks since their tails did not flash the tell-tail rich rust of a full adult. See some of what I saw by clicking on the attachment. A bonus is a couple of mourning dove photos. 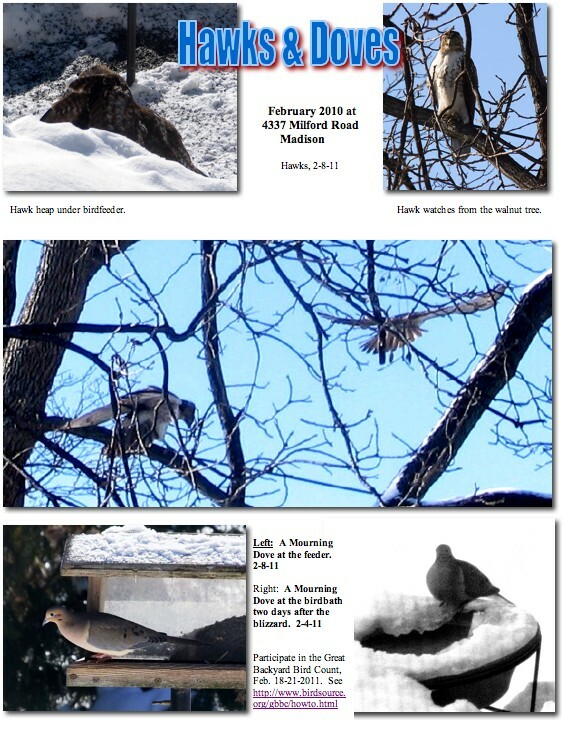 Bird lovers, amateur or professional, are invited to participate in the 2011 Great Backyard Bird Count. It’s easy. Just spend 15 minutes or more on one day or more, February 18-21, watching birds in your backyard, or actually anywhere you happen to be. Tally the species you see, and then report them online. Participants can also send in photos of the birds they see, and they’ll be posted on the site. 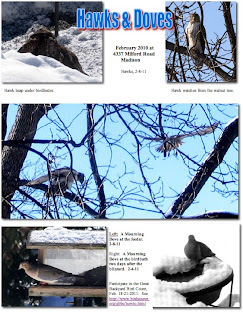 A link there will take you to a host of spectacular bird photos taken by participants in prior years. * Establishes permanent med drop cites throughout Dane County for expired and unused medications. Verona Road: I am the lead sponsor of a resolution asking the Wisconsin Department of Transportation to integrate changes to its Verona Road expansion plan that would protect the neighborhoods impacted by the construction. The requested changes include: installing noise barriers to mitigate increased traffic noise at the beltline/ Verona Road interchange; monitoring and mitigating air, noise, and storm water run off quality changes due to projected increased traffic; install bike lanes and sidewalks on all frontage roads and neighborhood roads being impacted. The resolution passed the full county board unanimously. Interoperable Radios: We are finally ready to break ground on the county’s interoperable radio system. The end result establishes seamless communications between all of the county’s police, fire, and EMS service providers. Since so much time had passed between our original contract to build this service in 2009 and finalizing the details of the system in February of 2011, the county was able to considerably decreased construction costs—from the original $30 million proposal, to the $18 million scaled-down version, to a final contract bid of $14.8 million. And annual maintenance costs are much less than originally budgeted for as well. Phew! After more than 2 years working on this, I’m looking forward to the successful end result. Lake Levels: There are several proposals making their way through county board committees that aim to better regulate the water levels on Lakes Mendota, Monona, and Wingra. The goals are to simultaneously maximize recreation on the lakes and minimize the likelihood of flooding and shoreland erosion. At issue is how to accomplish both those goals. The various proposals may impact the type of boat you can have on the lakes, how fast it can go, and where you can have it. More to come as proposals move through the committees. Badger Prairie: The County’s new Badger Prairie Health Care Center opened in February, ensuring continued high quality care for our most vulnerable citizens. The new center provides specialized long-term care for up to 120 senior citizens and adults with disabilities who have needs that are too challenging to be met in standard nursing homes. There are several green features to the building, including geo-thermal wells to reduce heating and air conditioning costs, energy efficient lights and temperature controls, and the use of recycled materials. As a result, the county was awarded more than $60,000 in clean energy rebates. And the building is expected to save taxpayers approximately $100,000 in energy costs each year compared to the former facility. County Employees Union Contract: The county board approved a new 3-year contract with our union employees. There will be no salary increases for 2012, 2013, or 2014. And, with a reworking of some health care services, the county will save money compared to last year—More than $1 million each year is expected in savings compared to years past. The contract provides stability for both the county and the workers, something that is sorely needed these days. Census Data: The census numbers for Dane County are expected to be announced this spring. If the county has more than 500,000 people, state laws may be activated that force changes in a wide array of county programming. Some programs may get exponentially more funding; some programs may be taken over by the state or another separate entity; some elected positions may change. It is bit unclear what laws will apply to us or which laws will be enforced by the state. We’ll have to stay tuned and see just how popular Dane County has become. Parks and Open Space 5-Year Plan: I am pleased to have been appointed to the Dane County Parks and Open Space Planning Committee. The Plan is developed every 5 years and is meant to serve as a guide to county government and elected officials when making funding decisions. It addresses countywide needs for public spaces and recreation, including the creation and preservation of parks, hiking trails, bike trails, camping sites, public fishing access, public hunting access, land purchases, dog parks, wildlife protection, and water protection. This is a yearlong process that will begin with a series of public hearings throughout the county. Vote: The spring primary election is Tuesday, February 15th. Primary races for Dane County Executive, Madison Mayor, and Wisconsin State Supreme Court will be on the ballot. Please vote! Read the article about our neighborhood written by 3 Edgewood College students that was printed in the December 2010 issue of Sustainable Times. Just click on the attachment referenced above. Thanks to Sustainable Times editor George Zens for providing this article for reprint. 7 - Go Big Read Book Discussions Feb. 13 in Neighborhood, Feb. 24, Fitchburg. The Immortal Life of Henrietta Lacks by Rebecca Skloot, a New York Times Notable Book, is an all-UW-campus and community read about the African-American woman whose cancer cells have aided research, but which were taken without her knowledge. It’s also the story of her very poor family in the Baltimore area. Two chances to join the discussion are coming up soon. The first is in our neighborhood at Prairie UU Society this coming Sunday at 11:45 a.m. Bring finger food to share. The second is on Thursday February 24th from 7-8:30 pm in the Fitchburg Room of the Fitchburg Community Center (5510 Lacy Road). Refreshments will be provided. For more information on the Go Big Read Program, see http://www.gobigread.wisc.edu/. Whether you live in an apartment or house, if your building was built before 1978 and you have children under age 6 who spend time in your home – yours or daycare kids – you may be eligible for a program to get rid of lead in your residence. Except for some of the Belmar Hills single family homes, and the newer developments such as Renaissance and Avalon Village and the new apartments on Allied, many homes and apartments in the neighborhood were built before 1978. This doesn’t necessarily mean they have lead in them, but if they do and you have young kids, you may be eligible. The significance of the 1978 date is that lead paint was banned in September 1977. Parenthetically, the US Environmental Protection Agency now requires that all renovators who work in homes built pre 1978 and disturb more than six square-feet of lead paint be RRP certified. Are you worried about the failing memory of a loved one or maybe even wondering about your own memory? The Urban League is sponsoring an Alzheimer’s screening all day Saturday, February 19. The screening is open from 9 am to 4 pm at the Madison Urban League of Greater Madison, 2222 Park Street. The screening is free. For more information about this event, contact Charlie Daniel, Alzheimer’s and Dementia Alliance of Wisconsin at (608) 204-9789 or toll-free at 1-888-308-6251. This memory screening day honors Dr. Solomon Carter Fuller, the first black psychiatrist in the United States. He played a key role in the development of psychiatry in the 1900s. Carter worked closely with Dr. Alois Alzheimer, the namesake of Alzheimer’s disease. The American Association of Retired People is offering scholarships to women. Apply by March 31. Scholarships may be used for any course of study at an accredited public or private school, including a community college, four-year university or technical school. The money, which is payable to the institution, may be used to pay for tuition, fees and books. Graduate students are discouraged from applying. Scholarship recipients who wish to reapply for a Women’s Scholarship for a second year of assistance. Teen Tech Week is March 6-12! In honor of that, the Fitchburg library is sponsoring a gaming night on Friday March 11th from 6-9 pm in the Oak Hall Room of the Fitchburg Community Center (5510 Lacy Road). The event will feature the following: Wii Mario Kart Tournament and prizes, Guitar Hero, Laptop computers with games & internet, board and card games, and refreshments. For more information, call 270-4205. Tuesday, February 15 is the day to exercise the right to vote in the Spring Primary Election. Spring, you say, with over a foot of snow on the ground? Don’t let that stop you. Since so few people tend to vote in a primary election, each person’s vote is worth more in choosing which 2 candidates will face off at the April 5 Spring general election. Wisconsin Supreme Court and Dane County Executive candidates will be on both the Madison and Fitchburg ballots. Supreme Court candidates are David T. Prosser Jr., Joanne F. Kloppenburg, Joel Winnig, and Marla Stephens. Dane County Executive candidates are Zach Brando, Eileen Bruskewitz, Scott McDonell, Joe Parisi, and Joe Wineke. Running for 10th District Alder are Brian Solomon, Nelson Donovan, and Thomas Farley. Vying for a mayoral slot are current Mayor Dave Cieslewicz, former Mayor Paul Soglin, John Blotz, Dennis Amadeus de Nure, and Nick Hart. Are you wondering which candidate best represents your hopes for the community of the many candidates seeking public office in the February 15 election? Help is nearby. If you didn’t get your copy of Candidates’ Answers that came with last week’s Isthmus, you can access it online at http://www.lwvdanecounty.org/ Besides Candidates’ Answers, this link has interviews with candidates for the Dane County Executive and Madison 10th District Alder. · Tune in to an interview. See http://www.cityofmadison.com/mcc12/kyc.html for the schedule or to listen to the archived interviews. They’re very helpful. · Check the Internet to see in the candidate has a website and to find articles from the press. · Or use a combination of these methods. A better informed voter makes for a better community. Since its beginnings in early 2010 the Dane County Regional Transit Authority (RTA) has held meetings around the RTA area to meet with local officials and discuss transit planning and options. We have also worked with officials and transit commissions in multiple communities to listen to demands for transit and possible service options for the region. Additionally, we have consulted with the staff of the MPO (Metropolitan Planning Organization) which does transportation planning for the same area as the RTA. The result is the Draft Phase I Plan for Transit which has been approved for circulation and discussion. At the suggestion of town officials, who have attended our sessions, we are sending it to all municipalities in Dane County. We do this to honor the request. However, it should be noted in accordance with the resolution adopted at our first meeting we will hold a referendum only in the RTA area. As a constituted municipal entity we cannot authorize a referendum outside our boundaries. We recognize that there is some misconception that if the referendum passes and a sales tax is imposed as to where it will be applied. Again, statutes are specific that the sales tax is only imposed within the RTA area. The plan is presented for comments and discussion. No decision has been made by the RTA on what or when to have a referendum. 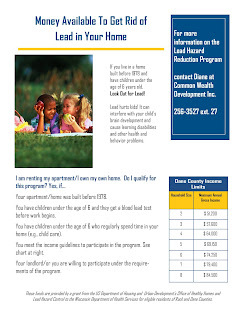 Additional information on the RTA can be found at our web site - www.danecountyrta.org <http://www.danecountyrta.org> - including a list of members and how to contact them. Comments may also be sent to David Trowbridge dtrowbridge@cityofmadison.com. The RTA has scheduled a public hearing at one of its regularly-scheduled Board of Directors meetings - Wednesday, February 9, 6:00 p.m., Fitchburg City Hall (5520 Lacy Road, Fitchburg) - to also receive comments from citizens who wish to express their views. We hope the product of our work can be improved by public discussion. Thank you for your interest in our work. Anyone interested in looking at the Draft Phase I Plan for Transit may contact Mary Mullen for a pdf copy that will be e-mailed upon request. Check the masthead of this e-News for contact information. The Dane County CDBG Commission invites residents to attend a public hearing to provide input on new and emerging housing, public facilities, and community development needs in Dane County (outside the City of Madison). The input received at this meeting will be used in developing the 2012 priorities for the use of Community Development Block Grant (CDBG) and Home Investment Partnership Grant (HOME) funds.